I was digging around in my stash one day looking for something when I stumbled on this lipstick. Yes, its a forgotten find and I’m so glad I found it! First, the name had me smiling and then then I opened the tube, the fuchsia tone had me eyes going 😯 Bright eh? 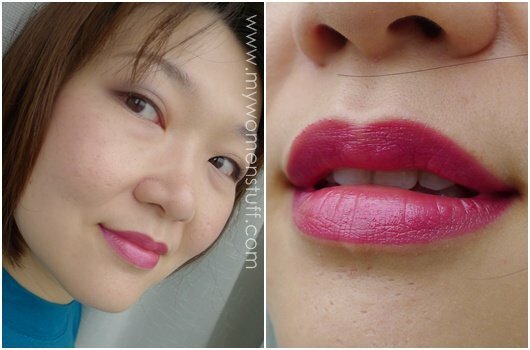 The swatch on my lips, as shown in the picture on the right is quite true to what it really looks like on. I will admit that it does look super bright and you have to be careful when you apply this because the colour is creamy and opaque. Just one swipe gives you that colour. Lovely! 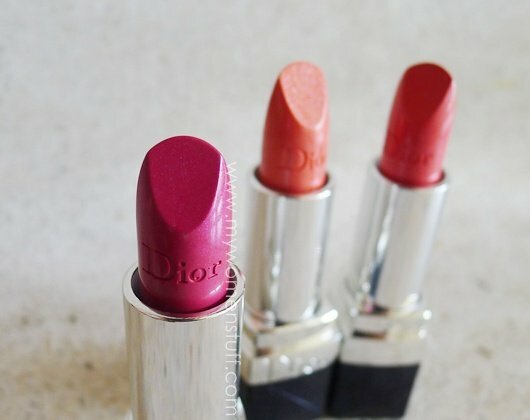 One thing I must note is the way the Rouge Dior lipsticks are moulded. I like the squarish slant of the lipstick as opposed to the sharp tear-drop slant we get in many brands. This squarish shape actually lends itself better to lipstick application if you choose to apply it straight from the tube. I get less of it going out of line and it is easier to control the application and shape too. PREVIOUS POST: Your Say: Are you influenced by the blogs you read? Love the look, i can’t wait for the Shiseido Shimmering Rouge! Keep it up. Oh PB-that is a great colour on you! I have this HUGE thing for fuschia, hot hot pink lipstick. Sometimes it just doesn’t work on me, but I still insist on buying them–some crazy obsession, haha! Must go check out this lippie! Rouge Dior definitely is one of my favourite lipsticks, love the moistness 🙂 those bright colors really suit your skintone, not so for me… btw what are the other 2 colors in the background? thanks! I love the color, it’s bright and pretty. I’m not sure I could pull it off but it really suits you. Thank you Gio and I’m sure it’ll suit you too! Such a beautiful colour on you!